Yes - you have to seize the moment - you can always tidy up later - you need another table - I have a fold up one that I pull out when I run out of space on my desk!! WOW you have been a busy girl, i'm thinking if you wanted to hide some of the mess you should of stuck with pic 2 lol but i guess there's no fun in that! I'm early in submission this week! Woo Hoo! Now off to bed... zzzz. You've been very busy! Well, like you, it's shame again for me, but am I bovvered??? Nope!! I have a give away too this week if you fancy a bit of me!!?? I am still so grateful for this concept... and I LOVE that you are so messy!!! I like the overhead shot myself! And really, from that angle, it doesn't look bad at all!!!! I can't believe I'm number 17!! ohoo I'm two people earlier this early morning! I've got one of those, and those, and is that that wacky tape? (or whatever it's called)I haven't got one of those, and I'd like one of those!!Hey! I think I'm tidier than you this week! Looks like you have been very busy creating! Good for you! Sometimes you just have to get her done and worry about the mess later. I like an aerial shot as it gives a very immediate perspective. Or I just want to jump in and help you clean up!!! Love your resist emboss index cards. Always helpful to have the technique instructions actually linked to the finished item. enjoy your week. Wow, that is busy and a little messy perhaps too. I want to come and tidy it. Bit far though. My ffle looked at the photo and said oh dear how can you craft on that! What does he know, sweep it aside. So good to be back. I have missed everyone. Julie, your desk is quite full of fun. I have to clear my off between creations. looks like you are super busy creating magic!!!! or a mad scientist!!! lol....thank you for hosting!!! have a super day!!! Goodness, did I just see a Christmas tree stamp? It's only August, but I guess I shouldn't wait till Dec. 14 like I did last year. I see about three inches of space, so it's probably not time to clean up yet. It would be for me, but not for you. I hope you have a good week. I'm thinking about you, just didn't have time to join in this week. ha ha Julia I always find your desk exceedingly consoling you know - as so know what you mean about not wanting to stop to tidy up- I just have not been in my spot to work for two whole weeks feeling sad but hey will get to it soon.. like look of your smile stamp, that is a cracker... and yes the requisite number of scissors:D happy WOYWW! Shaz in oz.x #28 at present. Busy girl! Hope you have a great week of creativity! Oh my Lordie Julia...now that's busy! Pressed the button before adding my number...what a numpty! That's what my desk looks like, sad to say! I started trying to sort and clean my craft room. Put some things in a box to give my daughter, some in one pile some in another, then realized that I needed to finish a project... The project is now done, so I hope to finish cleaning soon. It doesn't help my mojo, for sure! You have my sympathy. Hmm...pretty sure I just left a comment but then something weird happened. I don't know. So is this my second comment? Oh dear Julia...I'm sleepy! How terrific to know that family is indulgent of our foibles; of course the Mater won't mind. I'm thankful that my lot are so tolerant. The only reason to give your desk the shame name is because Share Your Shame has a nice alliteration. Otherwise, I just love the desk and the doings. Good to be round again in amongst my chaotic and taxing week. Both shots make it a desk I could be proud of. It's good to know that the greats can make a huge mess too :) Had a look at your other posts and love those cards. So wish I could come to some of your workshops, would love to learn how to do all those fab cards and things. Might need more than a cut lunch to get there though. Not sure what half those things on your desk are for, but it would be fun playing. 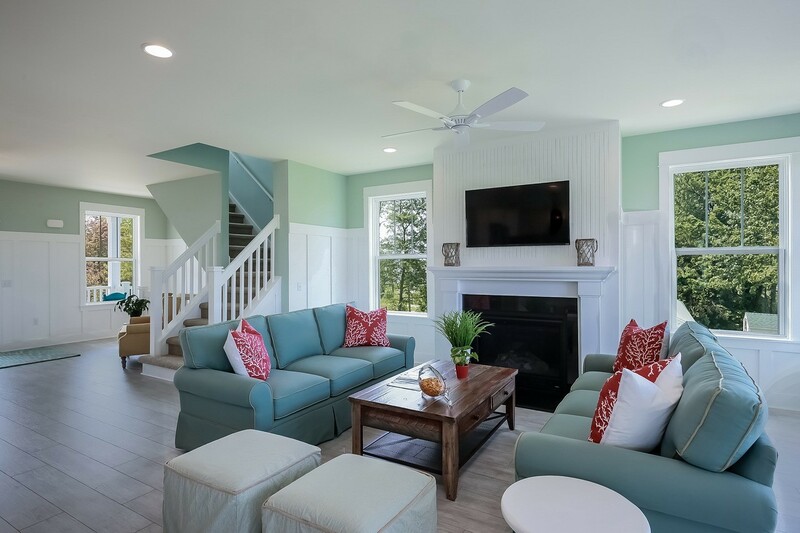 You are so right about cleaning being good for the soul, I am so loving my clean space and it seems easy-ish to keep it that way. I am not holding my breath though, there is no telling how long it will last when school starts in two weeks. 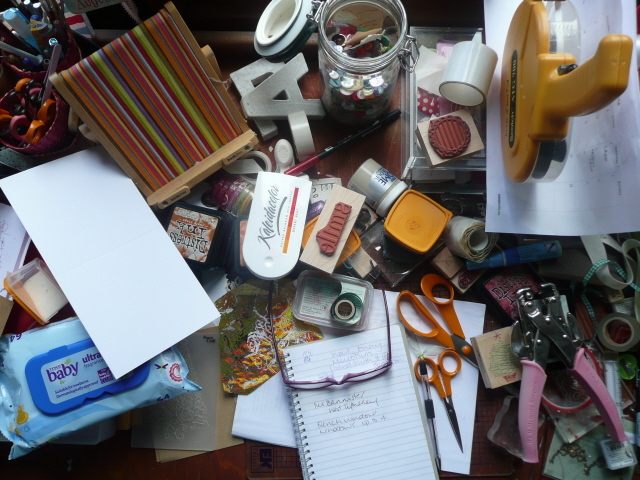 Wow, your desk is full of craftyness! My desk is still clean (for me) and it does feel good, wrong...but good! You just got to SMILE Julia! (yes, I see that stamp!) No WOYWW for me this week but wanted to stop and say Hello Girl! There's no shame in your game hun.... I love to see a busy desk - if only because my OCD won't let me have one! Have had technical issues this week and have entered the wrong thing at no 57 - is there any chance you can remove it for me? It's been ages since I've been able to join you, but I'm back! I bow to you, my queen, because your desk is a WRECK! lol I've had so many projects going, bits and pieces get left over from each project and before I know it, my desk is a mess. It's nice to know I've got excellent company! Love your busy desk shots! You'll get the A and P done some time, I know you!! You did confuse me with your link time this morning, I woke at 12.35 expecting it to be there. lol!! so I'm down at 40... see you some time! Thanks for hosting this great weekly snoop-a-thon! 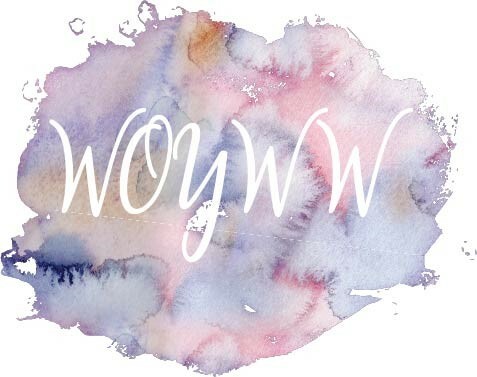 I am new to the blogging world and have just posted my first WOYWW link. 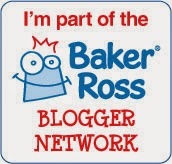 I have learned a LOT from visiting many other blogs and have been vastly inspired by many of them. A few of them are must visits for men through out the week. Thanks again! Ooooo, that sure is one 'busy' desk. You are certainly on a roll at the moment. Ah baby wipes. Why do I always feel I need to explain why I'm buying them when I get to the supermarket checkout? Didn't join last week - too much of a lazy cow to craft - but I'm back. I see you are going for the overhead shot yourself this week. The question is did you (like me) need to stand on a chair?! I can't believe I made it in under 100, it's been a long time since that happened! I'm back after a bit of a WOYWW break - hope you don't mind? Love that your desk always looks so busy and creative. Funnily enough I don't see mess I see stamps I want to play with!! I must be immune to mess. Ahem! Well, I have seen some busy desks (nice way of saying "messy") but this one beats all. Oh Julia, what is happening? Where are you crafting? Sorry, I have to leave - the picture alongside this comment box is messing with my eyes. Sharing my 2 shots of the same shame today, TSOTSS could catch on? That's one busy desk today Julia, looks as if you are having as much fun as I am. It's great to be back with you all after my hols, I've missed my desk fix!! I know exactly what you mean about being too busy to care what mess you've created, trouble is you only realise it when the space for actually working in disappears altogether!! I think the lack of space thing is something we can all relate to Julia. I usually end up losing stuff in the bin because it falls off the edge of the table. I’ve managed a bone folder and a bottle of Glossy Accents in the last couple of days and only noticed after the bin had been emptied and the dustmen had been…….need to go shopping now….what a blow, Lol! Your desk looks like you have been a very busy girl! Quit a pile going on there girl. Always love to see what you have been doing! I had a good snoop around the blog - not just todays post - I haven't been around last week so I missed a few! I would love to go to one of those "basic techniques workshops" I never really had anyone to show me the basics - it was all from youtube! Love your busy desk today - busy desks are the best of snoops! 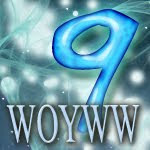 I am counting days till the WOYWW crop! I LOVE the pictures of your desk... it's like some brilliantly Memory game. I have to memorise as much as possible, then look away and try to remember what's there... fabulous!! If you manage to get this far down your comments list Julia, I will be mega impressed. Can you write your blog from your Ipad or do you have to us your pc ? Mine is an IPad2 and i have to go to my pc to add pics and blog. I am missing a trick here. I've just spotted that you have those Fiskars scissors that I've heard so much about - are they as good as claimed, I'm on the lookout for really good ones, mine are aging badly. Hi Julia, I don't think you're being shameful just productive. I am being rather er productive too or is it just being a hoarder. Is hard for me to say. Have a good week x. A "smile" stamp right beside a Kaleidacolor ink pad - that looks like perfection to me! Was stunned by the responses I received after entering for the first time last week, so had to enter again. I so know you mean!!! That was me last week. Creating on piles on top of piles. But I got it all cleaned up to start on my next project. So you won't see that mess today. Oh my!! But look on the bright side; your Muse has so many things to play with!! Oh my you have a very busy desk. Mine is spread out. Somehow I squeezed 4 desks in my space. Wow Julia that is a lot of craftyness all on one surface! I can spot the distress inks in there too! My desk is a lot smaller and I think it was any bigger it would certainly look like yours. Thank you Julia for your lovely comment. I know exactly what you mean, Momentum is a powerful force. I love the cards you are making for the workshops, SO Beautiful. I really wish I could attend. The resist colouring is my favorite, such bold color. You have an amazing talent for stamping. Thank You for the encouraging comment. It hurt, but Isa is happy with her threaded eyebrows;). I appreciate WOYWW, it really lifts my spirits. See you (and your awesome desk) next week. Happy WOYWW Julia!! I can relate...once I get working on a project it can become a big pile of ....craft stuff! But when I start not being able to find stuff...than it's clean up time. Oh Julia, it looks like you've been having WAY too much fun on your desk! Do you know what I love? Everything in the overhead shot is color coordinated! All oranges and reds...look at it again...you'll see! Oh thank you so much! You have enough clutter for the both of us. I'm afraid I've let my adoring public down by too clean a desk. I like those big happy piles like you have where you are on a roll so you don't want to stop. Those are fun times! Same shame! Oh, I need to go take a picture of my stamping/craft room. Yours is at least productive! I am so happy that I found your blog from your comment at http://goinovertheedge.blogspot. You are running a bit short on work space there Julia! Sorry it only a quick visit today. I am very sad, and not up to lots of chatting. Hopefully I'll be back on an even keel by next week. Very late checking back in... cravats to make! I felt right at home seeing your desk today. I ended up working on the floor again. Not good for the knees. It looks like you have been very productive. Don't you love your Kaleidacolor ink pads? I know I love mine! Hi Boss! I didn't have a minute to stop by this morning, and by some miracle remembered tonight! Another fab post and lots of linkies responding. This is probably not original, but I had a thought. I don't mean that having a thought is original for me (it's rare, but ...). What I mean is others have probably already thought of this. What do you think of having people put *new* or *1st* and then their name ONLY for their very first link? Like everyone else, I can't get all the way around every week, but I do remember being new and nervous and I'd like to make sure I leave a comment on anyone's blog that are first-timers that week. That's it. Have a great week and for the love of God, woman, clean up that mess!! Well, I could always send you a kit instead of moving over lock stock and barrel! The question is...Pink or Blue? Well done, very tidy desk today, trouble is they never stay that way!! Julia, you know what I am finding interesting? Well even if you aren't I'm gonna tell you anyway. I love snooping over all the desks each week. 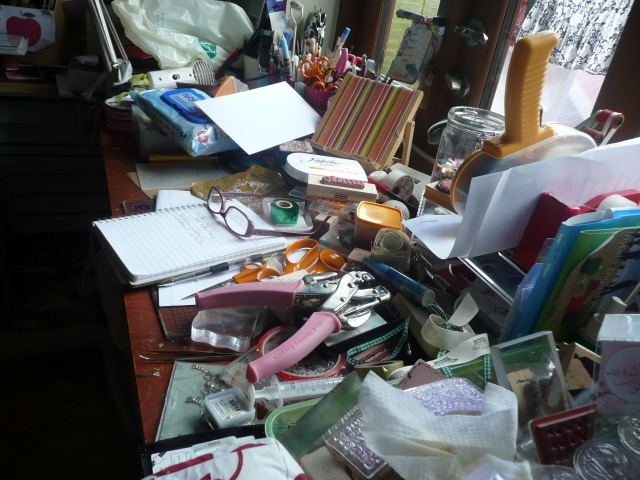 I used to think that I love to see the tidy desks (probably in hopes that I actually will clean mine)but I am finding the untidy desks are much more interesting. I get to see what people are eating (when wrappers are left behind, an empty tea cup, half finished projects, yummy stamps, etc. So no worries about your desk. I find it much more enjoyable when in disarray! Thanks for stopping by my desk. Have a great week. What a lovely mess you have this week! Where do you work in it? Take care and thanks ever so much for hostessing this linky party and making it around to so many of us fellow crafty bloggers! I'm afraid I didn't make ti to WOYWW this week Julia - too muych else on my mind and I didn't remember till it was too late. A quick update on Dad in case anyone is reading this - thanks for all the lovely comments, thoughts and prayers for our family. Dad is slightly better today but has had a bad dip. He's up and down, still in hospital, but we are hoping this is a real improvemenmt this time. My sister's been down staying with Mum for a few days which takes the pressure off my hubby. I'm feeling very exhausted and not doing anythiing atm except immersing myself in the wonderful Paralympics so don't expect any sense out of Shoshi for a week or two!!! Now that's one busy desk! I can feel your pain, I know next week everything will be neat and tidy. Mine looks like yours quite often, thankfully I have two work spaces. Sometimes I need 3. :-). Have a great week!